We know, to some, it will seem as if we are too excited for this Spring season and they would not be completely wrong in that assumption. However, can you blame us? Look outside, it’s warm, windy and sunny, just the perfect combination. And this, especially for those that absolutely adore the outdoors. And what goes best with outdoor sports? Well, softshell jackets, of course! Yes, welcome once again to another single review! 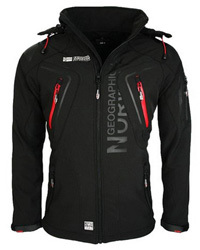 For this one, the softshell selected is by Geographical Norway and it is the Tambour design. This is a men’s jacket, designed for wearing it from Autumn till Spring, and with the numerous features it comes with, it is about time we took a detailed look at it. In general softshells are intended as sports jackets and this due to the material and the design, which allows for ease in movement and flexibility. These design features are mostly focused on the sleeves and shoulders, in order to not affect performance. 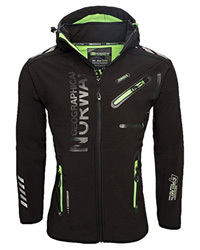 They make great layering jackets and are very suitable for physically challenging sports. 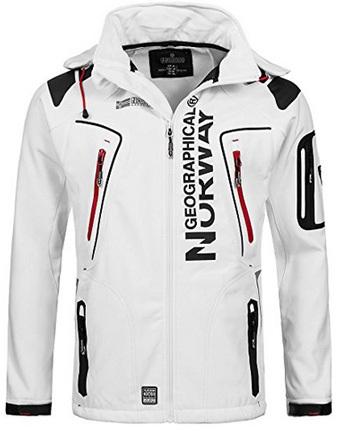 However, the more recent designs, especially those by Geographical Norway, can be enjoyed even by those who just want a versatile and quality jacket. Tambour can be used for daily wear, for when you go jogging, running or out to walk the dog, and would like to have something reliable on. 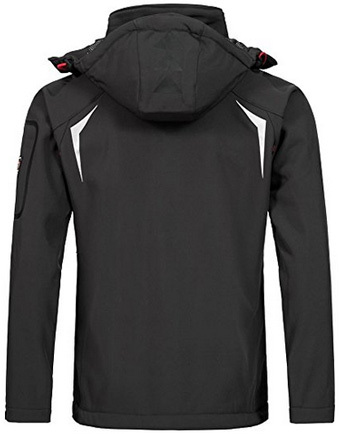 This is a hooded jacket, with a detachable hood, lined with mesh fabric on the inside, for breathability. To the front, there is a high stand-up collar, which zips up and comes with chin guard, to protect the chin. The sleeves come with Velcro fasteners on the cuffs, for adjustment. Also for adjusting and better fitting, around the hem, there are drawstrings to tightly fit the jacket around the body. This will prevent cold drafts and rain from getting inside. As for pockets, there are numerous, so your hands will be free. There are two zippered pockets on the sides and two on the chest, all lined on the inside. Then, on the left sleeve there is also a zippered pocket. And if you would like to keep the most valuable belongings a tad safer, there are also two inner pockets. In overall looks, there are several logos on the front and pattern details on the back and shoulders. Tambour, as it is common with softshells, is made mainly of Polyester. The exact material combination is 96% Polyester and 4% Elastane. This makes the fabric elastic, easy to move around in and comfortable to wear. On the inside, it is lined with 100% Polyester fleece on the back and on the sleeves. Fleece is typically breathable yet highly insulating. This is especially important if you are going to wear this jacket in winter or for layering while in freezing temperatures. The front part on the inside, is lined with mesh fabric, to help make the jacket more breathable. 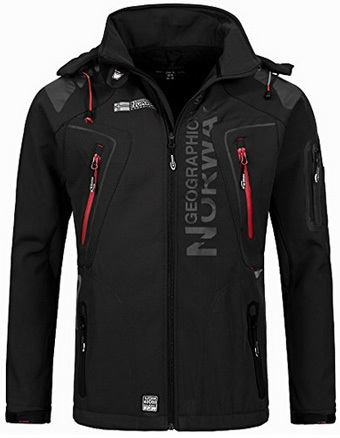 This is a weather-resistant jacket, which has a water column of 3000mm and is completely windproof. When it comes to the key feature, breathability, it has a respiratory activity of 5000 g/m2/24h, which will prevent overheating effortlessly. The colors available for Tambour are five: Black, Dark grey, Red, White and Royal blue. They are matte colors, with black and white details for contrast. These colors are easy to combine with other sports clothing, especially because of the main color/detail combination. 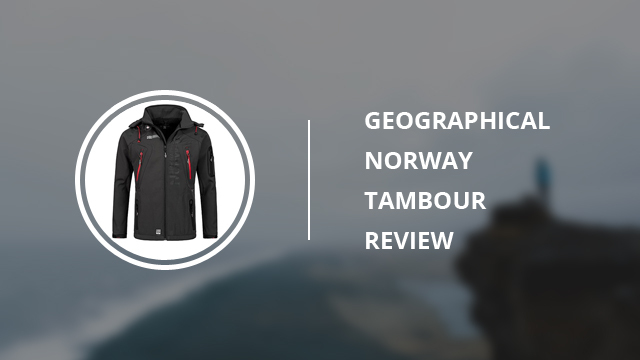 Because Tambour is a recent launch by Geographical Norway, previously featured in this new collection, it does not come with a crazy number of online reviews. However, so far, the overall online rating is pretty good. First of all, the quality is instantly obvious, which then only gets reinforced when you see the jacket in action. It is high-performance. Wearing it is quite comfortable, as it is a lightweight jacket. For those travelling, this is a big plus, more so because the jacket also packs easily. When it comes to size, because of the elastane and the design itself, it tends to run a bit bigger, but that shouldn’t be an issue, especially during the colder months. Overall, Tambour is a quality softshell that will make your outdoor time a lot more enjoyable and carefree. You won’t have to worry about the unstable weather or the jacket becoming an issue. So, if you are looking for an affordable softshell, by a good brand, we say go for it. 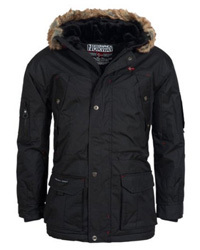 Purchased my geographical Norway jacket from a well known high street retailer. loved the quality high end look, versatility and breathability. This is a great jacket for outdoor activities with its windproof and water resistant qualities. 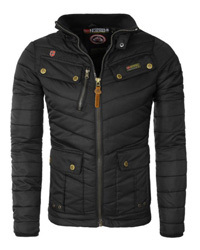 The jacket does not restrict movement and provides a comfortable fit. I was pleased with the high quality finish and expensive look to the jacket. The jacket is good value for money and worth every penny. I have great admiration for the brand and will certainly look at purchasing further items in the future! Thanks for your review Dan!